We are a modern family practice, committed to providing excellence in dental care and customer service. We offer a wide range of routine family and preventive dentistry as well as the latest cosmetic dentistry, teeth whitening, dental implants and restorative treatments founded on a fully preventive approach to oral health. 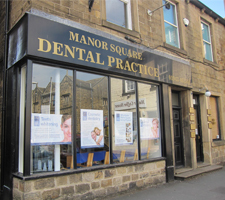 Our large but friendly Manor Square Dental team is made up of seven dentists, a therapist, a practice manager and our nursing and reception staff. Our modern treatment rooms are fully-equipped to high dental specifications whilst maintaining a comfortable and reassuring atmosphere to help you and your family feel as relaxed as possible during your visits with us. We know that changing dentists can be difficult. In choosing Manor Square Dental Practice, you can be sure we will listen to your needs and be open and clear about your treatment options and costs. So, if you’re looking for a simple dental check-up or more complex cosmetic dentistry treatment in Leeds or the surrounding areas of West Yorkshire and North Yorkshire, please call us on 01943 461501 to arrange an initial consultation.